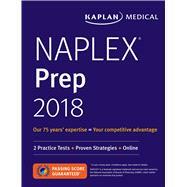 by Brooks, Amie D.; Sanoski, Cynthia; Hajjar, Emily R.; Overholser, Brian R.
Kaplan's NAPLEX Prep 2018 is your step-by-step guide to scoring higher on the North American Pharmacist Licensure Examination. Fully updated to match the test change, this edition is distilled to high-yield content for efficient, portable review. Our essential guide comes with access to additional content and practice tests online, so you'll have everything you need to face the exam with confidence. Amie D. Brooks, PharmD, FCCP, is associate professor in the Division of Pharmacy Practice at the St. Louis College of Pharmacy and a clinical specialist in Primary Care within the St. Louis County Department of Health. Cynthia A. Sanoski, BS, PharmD, FCCP, BCPS, is chair of the Department of Pharmacy Practice at the Jefferson School of Pharmacy at Thomas Jefferson University in Philadelphia, Pennsylvania. Emily Hajjar, PharmD, BCPS, BCACP, CGP, is associate professor in the Jefferson School of Pharmacy at Thomas Jefferson University in Philadelphia, Pennsylvania. Brian R. Overholser, PharmD, FCCP, is associate professor of Pharmacy Practice in the College of Pharmacy at Purdue University and adjunct associate professor in the Division of Clinical Pharmacology at the Indiana University School of Medicine in Indianapolis, Indiana.